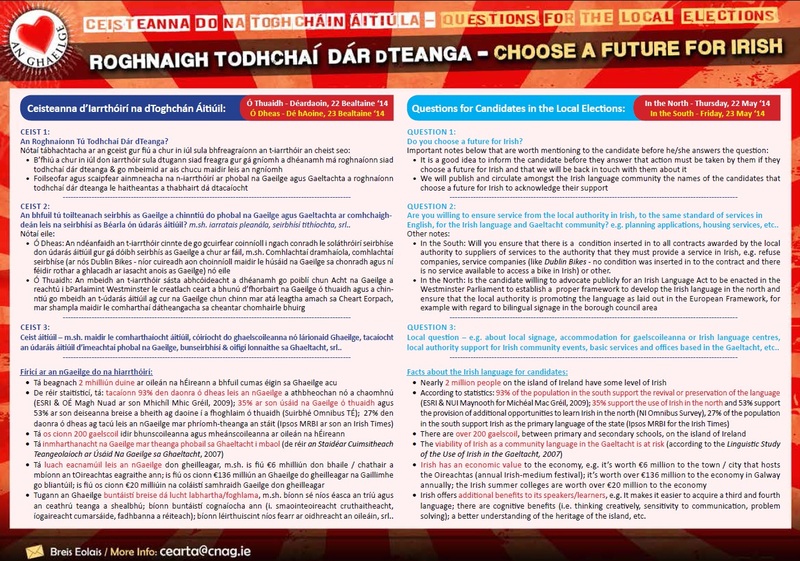 A leaflet issued by Conradh na Gaeilge with suggested questions for all local government and European Election candidates for the 2014 European and Local Elections. 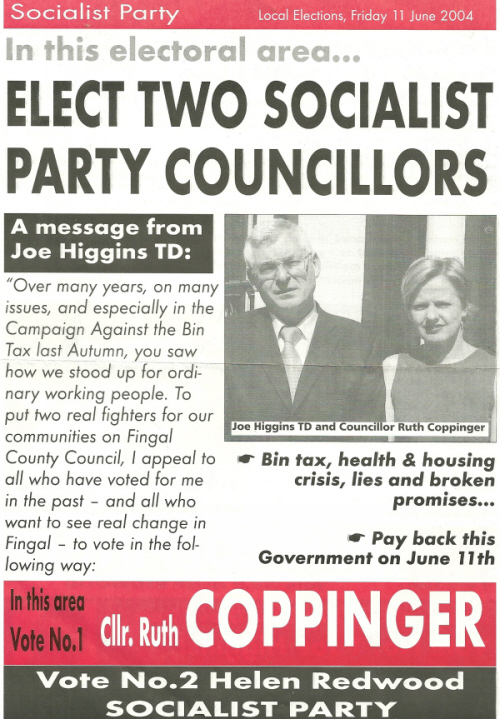 From the 2004 Local Elections a Leaflet from Socialist Party candidates Ruth Coppinger and Helen Redwood with the headline “Elect Two Socialist Party Councillors” . The two were running in Mulhuddart, Ruth Coppinger was elected with 1,848 votes whilst Helen Redwood polled 607 votes and missed out on a seat. 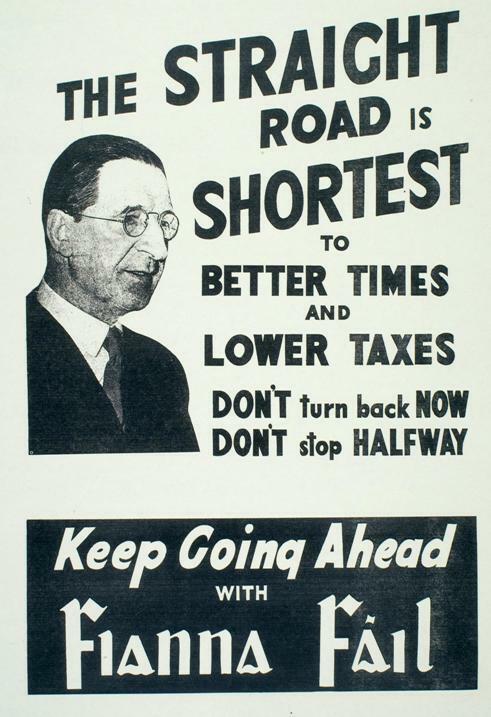 The leaflet also asks voters to vote for Joe Higgins in the European Elections. From the 2002 General Election a leaflet from Darragh O’Reilly running for the Christian Solidarity Party in Dublin South West. A former Principal of Tallaght Community School, O’Reilly polled 760 votes. In the 1979 Local Elections he stood for Fianna Fail in the Whitechurch (Rathfarnham) ward winning 1334 votes but failed to win a seat. 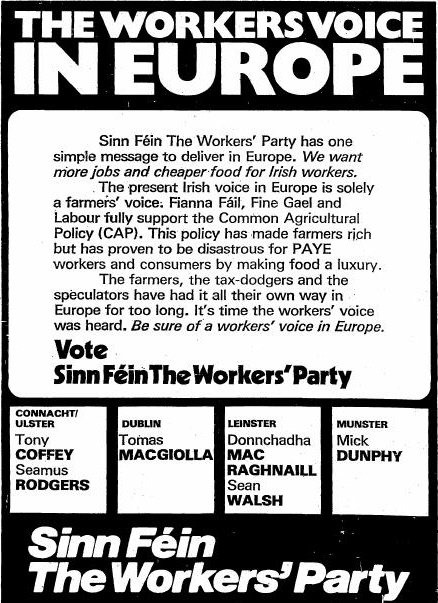 From the 1979 European Elections,”The Workers Voice in Europe” from Sinn Fein The Workers Party. There is a message of how the current representatives only had farmers interests at heart rather than workers interests. The party’s candidates Tony Coffey, Seamus Rodgers, Donnchadha Mac Raghnaill, Sean Walsh, Tomas MacGiolla and Mick Dunphy are listed at the bottom. 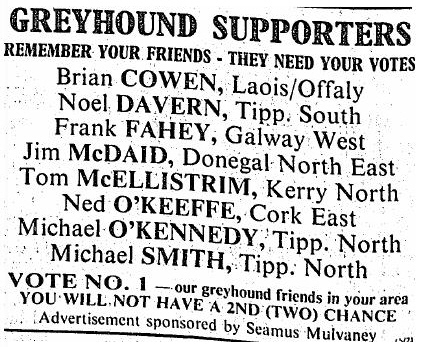 From the 1989 and 1992 General Elections , ads sponsored by Seamus Mulvaney urging Greyhound Supporters to remember their Friends when they voted. Amongst the friends were Brian Cowen, Frank Fahey, Michael O’Kennedy and Ned O’Keefe. Indeed all the friends listed were Fianna Fail TDs or Ministers.